Convert DVD/video to iPad compatible video/audio formats , manage iPad files. Innovative software utility gainings from the specialized in download directories! Investigate the popular computer software families, check the hottest versions of the cutting-edge solutions, and get for free! Do not toss away an advantage to obtain the best software applications: use SoftEmpire directory to get software programs for free. See the website of free utilities and software program trials. pick out among OS softwares, try planners, antiviruses, and all other kinds of utilities for your PC or digital gadgets! 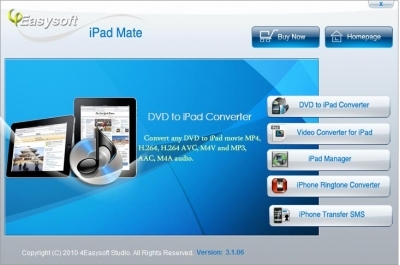 4Easysoft iPad Mate packs four iPad software: DVD to iPad Converter, Video Converter for iPad, iPad Manager, iPhone Ringtone Converter, iPhone Transfer SMS. It can convert DVD/video to iPad, manage iPad files by transfering files between iPad and PC.